In March, Elmhurst Cool Cities and Elmhurst College will partner to screen an environmental documentary about clean energy as part of the 2018 One Earth Film Festival. The One Earth Film Festival presents compelling environmental films and programming to bring about an understanding of climate change, sustainability and the power of people, and to initiate positive actions for the planet. The documentary Happening: A Clean Energy Revolution will be shown on Sunday, March 4, at 1:00 p.m. in the Schaible Science Center, Illinois Hall. 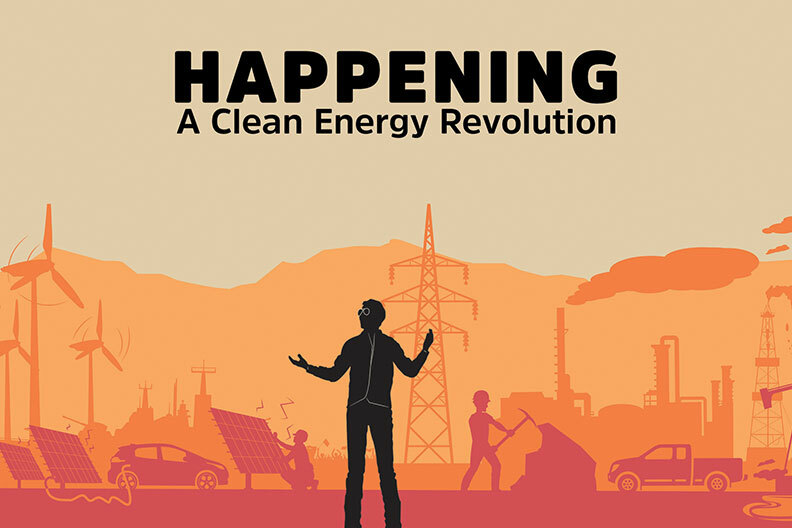 Happening tells the story of the citizens, business leaders and politicians who are championing the clean energy revolution. Director James Redford embarks on a personal journey into the dawn of the clean energy era as it creates jobs, turns profits, and makes communities stronger and healthier across the U.S.
A short question and answer period with environmental advocates will follow the film, facilitated by Professor of Political Science Teri J. Walker, who also chairs the political science department and is a member of the Sustainability Committee at Elmhurst College. Post-film questions will be addressed by Jeff Gahris, of the Illinois Solar Energy Association and Sierra Club River Prairie Group; Dan Huntsha, of Faith in Place; and representatives from other local advocacy groups. In addition to Elmhurst, three screenings of One Earth Film Festival movies are scheduled in DuPage and Kane counties. Waubonsee Community College in Aurora will screen Rancher, Farmer, Fisherman on Monday, March 5, at 7:00 p.m.; College of DuPage will present Wasted! The Story of Food Waste on Tuesday, March 6, at 7:00 p.m.; and the Glen Ellyn Environmental Commission will host After the Spill, Thursday, March 8, at 7:00 p.m.
One Earth Film Festival reaches audiences all over Chicagoland with screenings of more than 30 award-winning films at 50 locations around the city and in surrounding suburbs. This is the fourth consecutive year Elmhurst Cool Cities and Elmhurst College will partner to showcase a film. The One Earth Festival runs from March 2-11. Tickets for most films are free, with a recommended $7 per person contribution to support the Festival. Tickets for Happening are limited, and the movie is expected to sell out. To reserve a ticket, visit oneearthfilmfest.org. Elmhurst screening sponsors include American Gardens, Bob’s Fresh & Local CSA, Community Bank of Elmhurst, Elmhurst Bicycle Club, Elmhurst Garden Club, Elmhurst Public Library, Elmhurst College, Hauert Law Office, the Hennen Family, JC Licht, Republic Services, ReThink Electric-Solar Division, the Ronnau Family, Sierra Club River Prairie Group, Stolper Insurance Agency, and Whitney Architects. For more information, contact Elmhurst Cool Cities at ecoolcities@gmail.com or (630) 426-9789. To view a full festival schedule of movies and events, visit the One Earth Film Festival website.